No one is wise by birth; for wisdom results from one’s own efforts. I did something that most people don’t do. I quit working at a job where I was comfortable and knew what I was doing, and I decided to start over doing something that made me anxious, completely uncomfortable, and I had zero experience doing. My journey through the first year as a yoga teacher was nerve wracking, blissful, eye opening and heart expanding! I began at a fitness studio, with one class on Wednesday nights. I worked my way up to seven classes, spread out between three yoga studios, one fitness center, and one adult education class. I said yes at every possible opportunity to share yoga; leading beginner classes, Yin, restorative, Vinyasa flow, and gentle yoga for seniors. For ten years previous to this, my full time job(s) have consisted of managing my farm (no one to talk to but animals and plants), cleaning for a church (solitary work, done when the building was mostly empty), and wholesale greenhouse production (again, conversations limited to plants, who don’t judge or talk back). I have never been in a profession that involved standing in front of a room full of people and speaking; a terrifying idea if there ever was one. My love of yoga practice led me to seek out teacher training, and the scope of what was opened up to me made me know without a doubt that I needed to share it with others, to the best of my ability. I learned a lot in this first year, and I know there are limitless lessons ahead. The biggest challenge for me was just getting used to living with being uncomfortable on a daily basis. I knew it was a temporary state, but I also had no idea how long it would last. It has been 15 months since I began teaching, and I can say I am no longer uncomfortable or nervous for the most part. Here are a few things I can share that might be helpful to anyone starting out in teaching, especially feeling like I did. If you are feeling anxious, you already have the tools to calm your nervous system, even while your mind insists on freaking out. Do all the things that you are telling your students to do; breathe, be mindful, slow down – these mantras echo in our own ears and work their magic. And when all else fails – pretend you are the great teacher you want to be right now. Even if you don’t feel it, speak with confidence. If you take your time, smile, and sound like you have it all together, they will never know you are a quivering mess on the inside. One of the tricks that worked well for me was to imagine that I was the owner of the studio where I was teaching. Since I have experience owning a business, this put me in a much more comfortable place in my head and helped my nerves subside a bit. My best classes were always the simple ones. There is a feeling when you graduate yoga teacher training and you are absolutely bursting with knowledge that NEEDS to be shared, and if you could just open the eyes of your students to everything that yoga is, they would be amazed and transformed just like you are and you can save the world! Well, you didn’t learn everything you know from one class, and neither will they. You will plan a lovely class that you are all prepared to teach, and when you arrive, something throws a wrench into your plans. Often the students you expect to get are not the ones that show up, and the speed or level of your flow will need to be modified on the fly. Sometimes its technical difficulties, and you will need to teach without that awesome playlist you spent so much time preparing, or the studio software is not working, or the heat, or the lights…etc. This is an aspect of teaching that I often really enjoy because it’s an unexpected challenge, and when you rise to it successfully, it feels amazing! I like to go to studios and practice with teachers that are new to me. I always learn something and come away with new perspectives, or inspiration to take to my own students. When I do venture into a new space for practice, I know that I may or may not love the class, but what makes the difference to me is whether or not the teacher made me feel welcome, supported, and made me feel she / he was happy that I was there. This is the key factor when I’m deciding to come back for a second class, or to never darken their doorway again. As a teacher, I try never to forget this. I want my students to know I am thankful they have chosen to practice with me, and I am there to absolutely support them in their practice. They might not like the first class, or they might feel anxious and self concious if they are beginners; but, if they made a connection somewhere in that time to their own breath, their own soul, maybe they will come back. That’s my job, and my intention. We are getting ready to move to NH, and I recently had to say goodbye to some students that have been with me from day one of that original Wednesday night class. It’s bittersweet, but the sweetest part is when people who had never had a yoga practice before attending my class told me they had been searching and found another teacher and class to replace me after I left. What a gift to know that I had a hand in setting them on their own yoga path! Sue came to yoga practice in 2009 for exercise and stress relief, but like so many, she discovered there was much more. She completed 200 hour teacher training with ShivaShakti School of Yoga and Healing Arts in 2015. She is currently continuing with their 300 hour advanced teacher training. She has completed meditative Yin yoga teacher training with Sagel Urlacher. 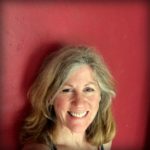 Sue currently teachers at Samudra studio in Saco ME, Breathing Room in So Portland, Spiral Tree in Portland, Fountain of You in Naples, and Massabesic Adult Education.